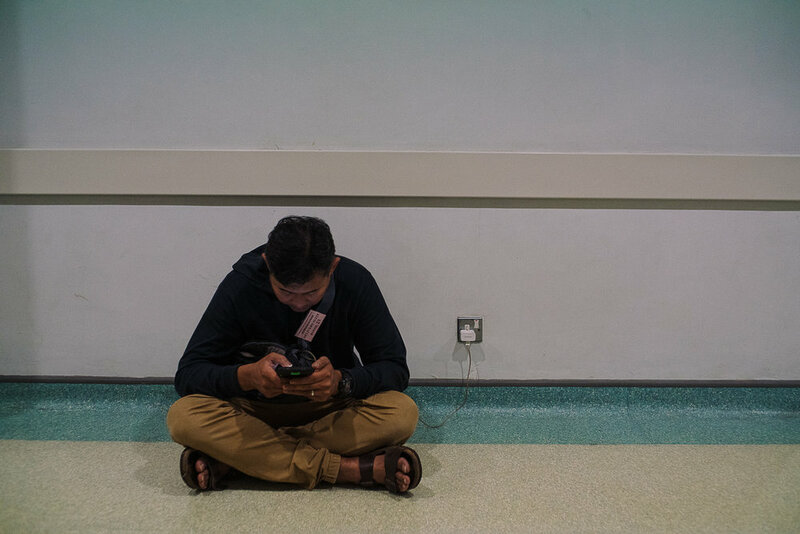 After being told by a second doctor that the baby would die if she was not delivered immediately, Raihan rushed Hidayah to the labour ward at the KK Women and Children Hospital, Singapore. Here, Hidayah was undergoing childbirth by a caesarean section while Raihan waited outside. 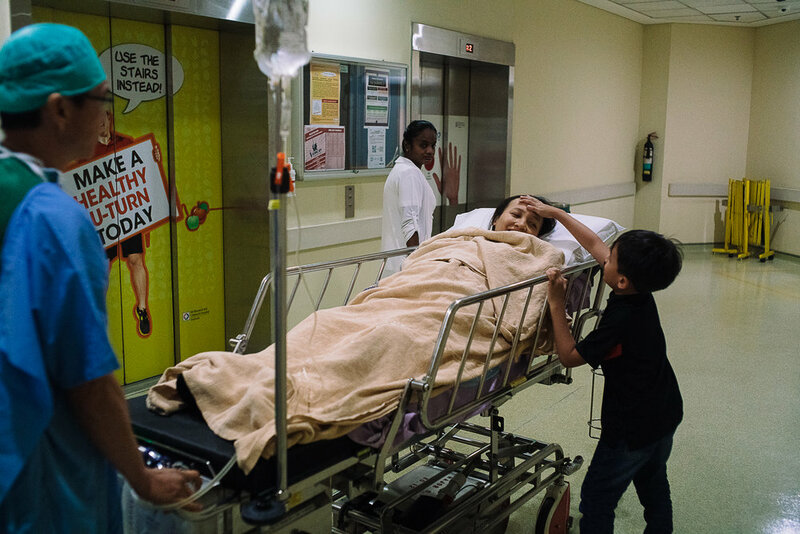 Two hours later, Hidayah finally came out from the operating theatre where her eldest son, Ryan, 8 years old, rushed to his mama's side to check up on her. But there were still no news of the baby yet at this point. Hidayah (R), Raihan (M), and Hidayah's mother (L), looked on in despair after confirming with the doctors that there might be something wrong with the baby. She was unresponsive and unconscious ever since she was born. While Hana was warded in the Neonatal Intensive Care Unit (NICU), other machines were set-up to conduct tests to find out what was the cause of the problem. She also had to be put on life support in the meantime. Just moments before, Hidayah asked her husband, "What if we have no choice but to pull out the plug on her? What will we do?" She broke down immediately after. As a husband, Raihan played an important role, not only as a caregiver for his wife who was still recovering from the operation, but also as her pillar of support in this difficult period for the family. This is despite him having to juggle his night shift work and family at the same time. Back in the ward, Hidayah cried every single time she heard the voices of other babies, wishing it was Hana's voice instead. Eventually, the nurses moved her into a single-bed room where she could focus on her own recovery. Upon being discharged, Hidayah's youngest son, Ihsan, 4 years old, came running in to hug his mother and asked where is the baby. Hana continues to be warded in the NICU. The doctors told the family that it would take awhile for all of the tests to be concluded before any findings can be shared with them. Over the course of the second week, Hidayah and Raihan spent every day with Hana at the NICU, sometimes armed with plenty of hope and other times, only with despair and acceptance of their fate. Doctors narrowed down the possibility to a brain damage after checking that Hana's pupil was unresponsive to light nor did she moved when inflicted with controlled amount of pain. Hana needed to be sent for an MRI scan to determine the extent of the damage. Hidayah looked on with a smile, pinched by a little hope that she would be able to buy for Hana a pretty set of baby clothes one day. After close to 14 days, the doctors finally called in a meeting with the parents. Hana was diagnosed with a severe neonatal encephalopathy, which meant that there was damage done to parts of her brain that controlled the signal to and from the body, and also other basic functions such as breathing and swallowing saliva. The doctors were not able to provide any firm guess as to how much time Hana was left with. They added that if she miraculously survives the acute period, she would still be faced with a severe case of cerebral palsy in her future. "We'll live one day at a time from now onwards. Each day that Allah (God) grants us to care for Hana is a gift in itself. We'll continue to cherish the gift until she's no more a gift." Hidayah's mother (foreground) and father (background, in white) tried their best to provide support for their daughter in every possible way. Here, the preparation for a prayer dedicated to Hana is underway at Hidayah's apartment. Hidayah and Raihan dreamt of having a daughter for many years and when this unexpected fourth pregnancy revealed that it would be a girl, both parents were extremely happy about the news. Hana was growing well and healthily for seven months until a complication suddenly occured in the eight month that forced a premature childbirth. Both Hidayah's mother (M) and mother-in-law (L) visited Hidayah a day after she had been discharged from the hospital. Hidayah's mother (L), mother-in-law (M), and sister-in-law (R) reciting the Yaseen, or the heart of the Qur'an, and praying it for Hana's well-being. Islam teaches that every test in life comes from Allah and that He ensures His believers will not be tested beyond than what they are capable of handling. Such beliefs helped Hidayah to resign to her fate and eventually come to full acceptance of this test that she needs to overcome. Before the pregnancy complication happened, Hidayah's three sons were excited to welcome their baby sister home and were looking forward to taking good care of her. Ihsan (L), Ryan (M), and Adam (R) on their way to the hospital to visit Hana. After two weeks in the NICU, Hana was eventually transferred out to the Special Nursery Care (SNC). Not feeling optimistic about Hana's chances, the nurses in SNC encouraged Hidayah to dress her up with something from home. Understanding the time-sensitivity of the situation, the SNC nurses even went out of their way to bend the rules, that only allow the parents and grandparents of each patient to come during visiting hours. As a result, they made special provisions to allow all family members to spend time with Hana. Transferring Hana from the bed to her grandfather needed to be done gently as the wiring and tubings attached to her are highly sensitive to any movement. My sister, Hidayah, feeling tired after many days of visiting the hospital from morning till evening, before rushing home to attend to her other three sons. Raihan, who works on night shifts, would take turns with Hidayah to visit Hana. While Hidayah stays at the hospital from morning till afternoon, he would be at home taking care of Ryan, Adam and Ihsan. And when Hidayah returns home in the evening, he would switch place and spend time with Hana before leaving for work from the hospital. Hidayah's mother singing a tune of prayer for Hana on her visit. Despite having already accepted that the odds to any kind of recovery was high, there was still a lingering hope for a miracle to take place. Hana was constantly embraced by a family member at all times, hoping that the human touch and prayer lullabies would somehow turn things around. Raihan and Hidayah comforting Hana one last time for the day before leaving for home. According to my sister, she felt that Hana could tell her parents were returning home each time as she started to gasp for air louder and louder, as if asking them to stay longer. On 19th April, Wednesday, the SNC nurses felt that Hana's time was imminent and nearing soon. Estimating that she would not make it till the following Monday, they quickly arranged for Hana to return home. Friday, 21st April, Hana's paperwork were completed and the nurses helped to dress Hana up for her homecoming. One more briefing about the emergency numbers, should anything happen at home, before Hana was allowed to return home. Hidayah felt worried that she could not remember all the details from the many briefings she had to attend, just to get Hana home. Despite the frenzied check-out process, both parents were still happy to bring Hana home. Hana continues to be wired to the heart rate monitor and fixed onto the oxygen tank for support on the journey back. Once home, Hana's brothers could not leave her side, even for a short moment. They were constantly around her throughout the night. At 11pm, 23rd April, Hana began struggling even more to breathe. Hidayah and Raihan did everything they could till the following morning. Sensing that the end was near, Hidayah tearfully asked Raihan if he's ready to accept Hana's departure? At 540am on the morning of 24th April, Hana passed on in her mother's arms. Tears rolled down her cheeks as she took her last breath away. Family members consoling Hidayah of her loss and giving her words of strength to keep carrying on. After holding their emotions together for more than 12 hours, hosting visitors, they finally get to grieve on their own after everyone else had left home. "Dear Allah, we accepted our fate and Hana's departure but the pain of this loss is just too great to bear."